WASHINGTON, D.C. -- Americans' opinions of Pope Francis have become less positive this month, with 53% now holding a favorable opinion of the pontiff, down from 66% in August. However, among U.S. Roman Catholics, perceptions of Francis are unchanged. These data come from Gallup's latest survey, conducted Sept. 4-12, as the Roman Catholic Church faced continued fallout from the Pennsylvania state attorney general's report on allegations of sexual abuse by priests. A few weeks before the survey, Francis himself was confronted with a public call for his resignation over claims he had concealed allegations of sexual abuse leveled at a cardinal in the U.S. While Americans overall see Francis less favorably, U.S. Catholics' opinions of the pope have not shifted. Seventy-nine percent of U.S. Catholics have a favorable opinion of Francis, essentially unchanged from the 78% who felt the same last month. There has been no change in the 12% of U.S. Catholics who hold negative views of the pope. Although U.S. Catholics' opinions of Francis do not appear to have yet been affected by the latest controversies, Catholics are less positive about the pontiff than they were at his peak favorability. In 2014, in the midst of high-profile reforms to the Catholic Church, nearly nine in 10 U.S. Catholics had a favorable view of the pope. This has now fallen to nearly eight in 10. Views of Francis among non-Catholic Americans have dropped substantially during the same period. Among these Americans, 45% now hold a favorable view of the pope, compared with 63% last month and 72% in 2014. Similar drops in the pontiff's favorability have occurred among most other groups. The impact of recent controversies on Americans' attitudes toward Francis is analogous to the impact of a similar scandal on his predecessor, John Paul II. The percentage of Americans with a favorable view of John Paul fell precipitously from 86% in 1998 to 61% in 2002, after a sexual abuse scandal was uncovered in 2002. While Americans' views of Francis have clearly taken a substantial hit, he is still more popular than his immediate predecessor, Pope Benedict XVI, was before he left the papacy. In Gallup's final reading on Benedict, in 2010, 40% of Americans viewed him favorably and 35% unfavorably. 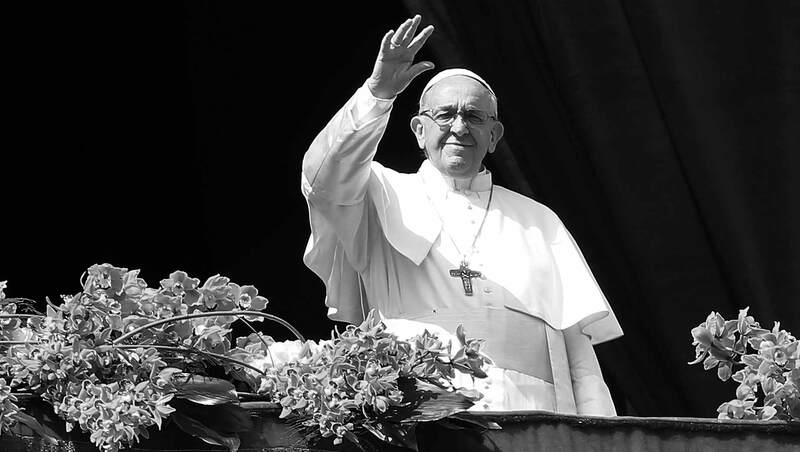 Americans' views of Pope Francis have been substantially affected by the controversies facing both the church and Francis himself, just as occurred for Pope John Paul II in 2002. 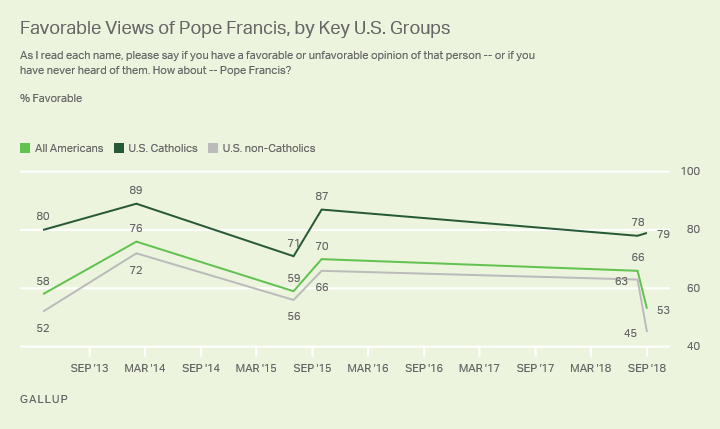 The decline in the pope's positive image is concentrated among non-Catholics -- U.S. Catholics' opinion of Francis are unchanged. This lack of impact for Francis among Catholics may indicate that the level of fallout the pope experiences will be limited. U.S. Catholics may not hold Francis responsible for the current controversies or may agree with the pope's response to them so far. Results for this Gallup poll are based on telephone interviews conducted Sept. 4-12, 2018, with a random sample of 1,035 adults, aged 18 and older, living in all 50 U.S. states and the District of Columbia. For results based on the total sample of national adults, the margin of sampling error is ±4 percentage points at the 95% confidence level. For results based on the total sample of 221 Catholic Americans, the margin of sampling error is ±7 percentage points at the 95% confidence level. All reported margins of sampling error include computed design effects for weighting.